You are here: Home / General / Is there a difference between PBS and WBS ? However, there is more to say about this difference ! I recently followed a conversation on Linkedin where this question popped up. Many of my colleagues replied with some plain theory or from their own experience. 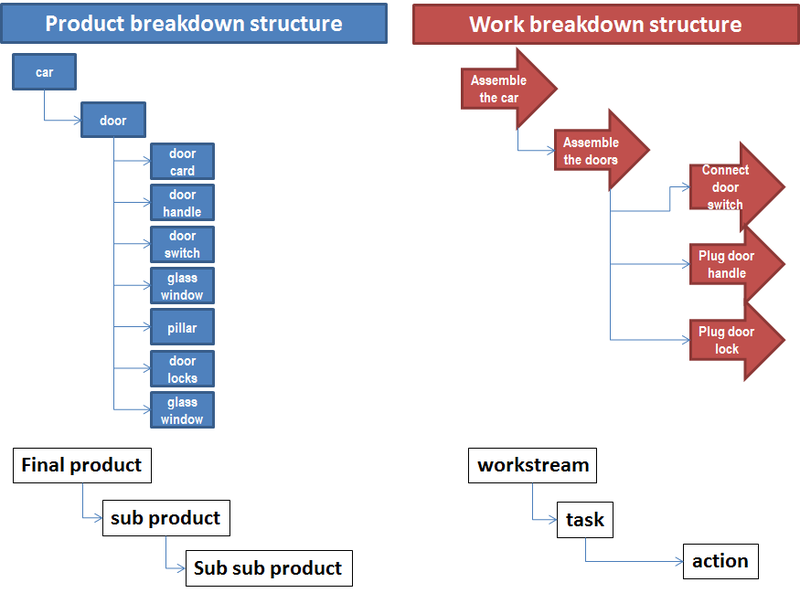 A product breakdown structure is a hierarchical breakdown of the products to be produced during a plan; in PRINCE2 a product breakdown structure contains just products. A work breakdown structure is a hierarchical breakdown of the entire work that needs to be completed during a plan; in PRINCE2 a work breakdown structure contains just activities. This illustration from Patrick Roose, also gives a more clear view on the difference between PBS and WBS. While diving deeper into this topic, I noticed that APM (Association for Project Management) have a similar definition about the difference between PBS and WBS in their APM Body of Knowledge. I wrote another (Dutch) blog article in 2012 about the use of a WBS while describing your project idea during the project initiation phase.